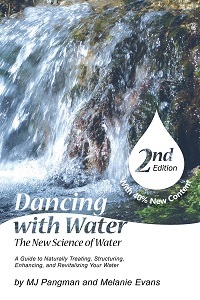 Dancing with Water - second edition - 40% new material! Dancing with Water is an engaging and well-referenced guide designed for everyone (professional and non-professional) interested in understanding and revitalizing their water. It accomplishes what no other book has attempted "the blending of science with esoteric wisdom that has survived the ages". Dancing with Water introduces the "New Science of Water," leading the way to a more complete understanding of water's liquid crystalline phase and of its biological significance. The authors have produced a compelling treatise for any reader who is truly interested in understanding the depth of their relationship with water. The book explains many of water's unique properties by examining its liquid crystalline structure. But don't worry... the authors have kept the lay reader in mind as they explain complex subjects in easy-to-understand language. Dancing with Water is the long-needed reference, providing credibility for many ideas and practices that have long been viewed with skepticism. It discusses the memory-retentive ability of liquid crystalline water; also its ability to transmit energy and information. The book provides insight into the effects of electromagnetic fields, crystals, salts, and the importance of the gases in water. However, the true beauty of Dancing with Water is reflected in its format, and in its graceful delivery, much like water itself. It is a guide intended to educate and enlighten the reader. Part I lays the foundation and the scientific basis. Part II provides instructions so that anyone can naturally treat, structure, energize, and revitalize their water. Dancing with Water will open your eyes and it will introduce you to your partner in life. Then it will take you to the dance floor and show you the steps to the dance. Whether you are a water enthusiast, a health practitioner, a scientist, or a lover of the natural sciences, Dancing with Water will touch your soul--and it will guide you as you enter a unique and inspiring new relationship with water. This is truly the best book I have ever read. Water is our most sacred and precious resource. No other book has been as informative, easy to read, well organized, thoughtful, thought-provoking, and empowering. So much about the universe is clear to me now. The authors provide clarity and guidance for how one can get started, immediately, regardless of finances. All of humanity can benefit from this book. Together, through a joint conscientiousness and love for our planet I know that we can work together to restore this beautiful planet. The knowledge that this outstanding book provides makes this possible. I am grateful to have learned so much. Hoping for a third addition. With love and gratitude, thank you so much for writing this book. Our bodies are primarily made of water and yet all our lives we have been drinking dead or contaminated water. Even worse, we are not even taught what elements water should have and how to make/ find it! I appreciate MJ's writing styke, as the concepts are explained in easy to understand terminology. I greatly appreciate that the entire book did not sound like a sales pitch. Now I revitalize, remineralize, and restructure my water and it is amazing how different water that actually hydrates the body feels. People who have tasted my water have said it tastes "fresh", without fully being able to describe it. As a lifelong city girl who has only tasted dead water, I am grateful for the knowledge imparted in this book. It is an easy read and completely necessary. I'm so grateful for this book - it has turned my pursuit of optimal health in the right direction - structured water as a "first food" in my diet structure. Get this book if you want optimal health! Thank you MJ Pangman Melanie Evans for your dedication to the well-being of all life forms with focus on how precious water truly is! I have been working on improving my water for years. Haven't been able to even come close to what you can achieve from the information provided in this book. Not only is the book filled with science on how to achieve this but I feel it is divinely inspired. I could actually feel the presence of the Divine as I read. This book is very up lifting and will provide you with the tools to experience awesome healthy water. This book was a blessing to have and read. It's probably the most beneficial book to have if you want to learn how to make real, clean and hydrating water. You will learn so much valuable information that you can't get in any school today. Definitely recommend this book to health enthusiasts or anyone who is looking to become truly healthy. Copyright www.dancingwithwater.com. All Rights Reserved. eCommerce Software by 3dcart.